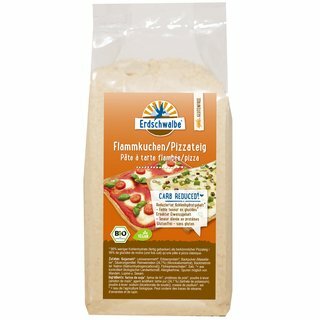 Erdschwalbe Tarte Flambée/Pizza dough. Gluten-free. Reduced carbohydrate content. Baking mix 150g-bag. Organic - EG-Öko-cert. 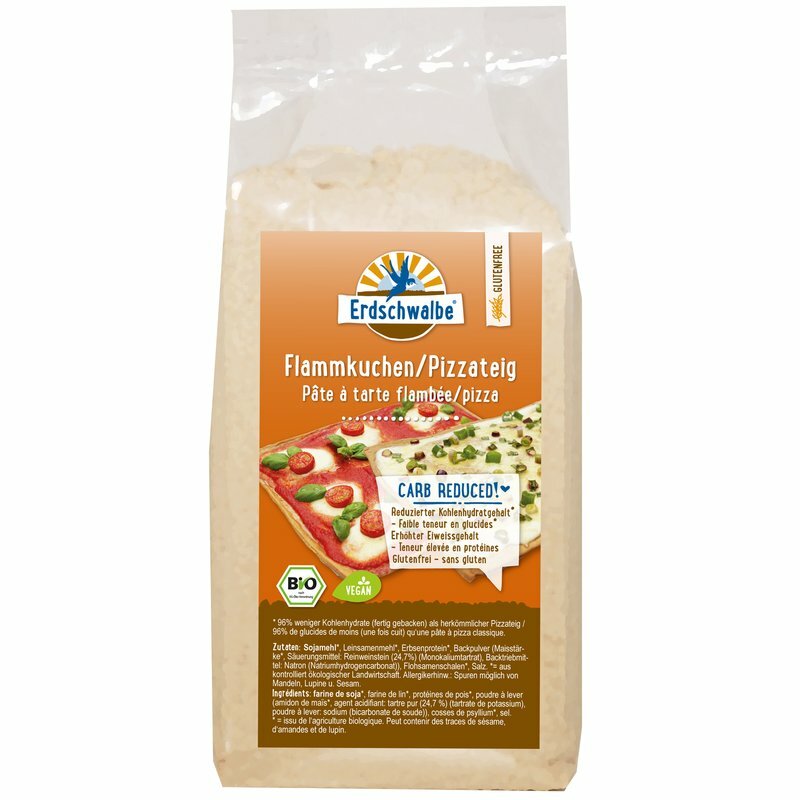 Erdschwalbe Tarte Flambée/Pizza dough gluten-free - Organic baking mix. Reduced carbohydrate content - 96% less carbohydrates (ready baked) than conventional pizza dough. Ingredients: Soy flour*, Flaxseed flour*, Pea protein*, Baking powder*, Psyllium husk*, Salt. *= from certified organic agriculture. Note for allergy sensitive people: may contain traces of sesame and almonds. Preparation: Knead the baking mix with 170ml of cold water and 1 tablespoon of oil in a bowl for 2 minutes using an electric mixer (kneading hook attachment). Shape the dough into a ball. Then roll out the dough between two sheets of baking paper into a thin sheet. Prick the dough surface several times with a fork. Lay the rolled out dough on a baking tray covered with baking paper and add the desired toppings. Put it into a preheated oven at 180°C for about 15?25 minutes depending on the toppings and bake until crispy. Storage: Store the baking mix in a cool and dry space. Makes approx. : 1 sheet of Tarte Flambée base.